A stupid person should keep silent. But if he knew this, he would not be a stupid person. Sugar stacks has some interesting visuals on how much sugar you are consuming. Quite a lot. Cubes of sugar are 4 g each. Someone has compiled several of the comparisons into one picture. Not that I oppose sugar any more than other forms of carbohydrate. But as many of us get more carbohydrate than we burn up, it may be prudent to decrease empty calories: soda, cordial, and fruit juice. Christians have often disputed as to whether what leads the Christian home is good actions, or Faith in Christ. I have no right really to speak on such a difficult question, but it does seem to me like asking which blade in a pair of scissors is most necessary. You literally use the word "literally" too much; and more importantly, you use it incorrectly. God is easy to please but hard to satisfy. This is quite nifty (if one ignores the global warming rhetoric). 60,006 kilometers; crossed oceans; and stopped at dozens of ports around the world. 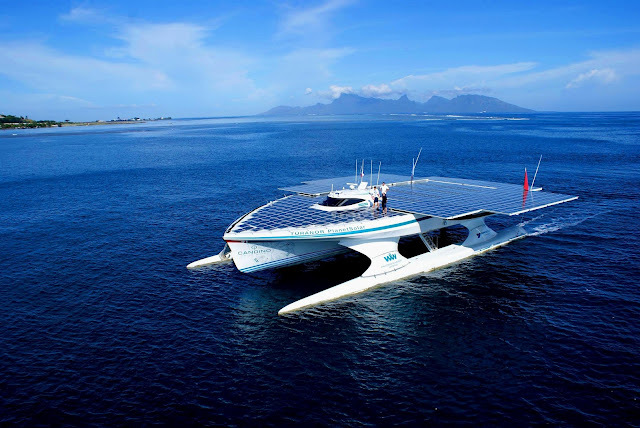 And Friday, having circumnavigated the world, the Turanor PlanetSolar and its crew arrived back in Monaco, where their journey had begun in September 2010. There is no safety for honest men but by believing all possible evil of evil men. I have come across this cartoon. Though the cartoon does not mention it, the sites I have seen it on seem to view it as an apologetic against right-leaning Christianity. Though I do not wish to address the moral and political spectrum here—perhaps at some stage as I find it important, and increasingly so recently—I think such a cartoon reveals biblical illiteracy and would like to de-construct it here. Before commenting on individual statements a couple of general statements are in order. Firstly, it is false to appeal to what Jesus did not do or was unwilling to do as an absolute condemnation of such activity. 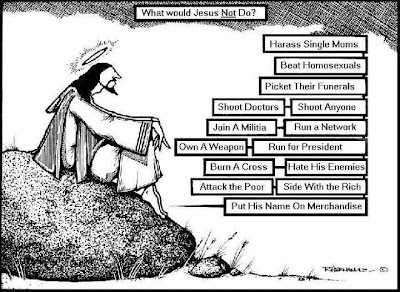 There are many things that Jesus did not do and refused to do for reasons related to circumstance and not immorality. Jesus had a ministry and would not be sidetracked from such ministry. He therefore refused to do some things that are perfectly legitimate for his followers. Secondly, Jesus is Yahweh. Though the trinity is more opaque in the Old Testament, Jesus is God, and Paul says Christ was the Rock that followed the Israelites in the desert (1 Corinthians 10:4). So if God does something it means that not only that Jesus would do such a thing, he did do it. 1. Depends what is meant by harass. When Mary (possibly single by then) wished to see Jesus his response was that those who hear the word of God and do it were his mother and brother (Luke 8). At another time Jesus challenged a woman married 5 times and living with a man whom she was not married to (John 4). Jesus does not shy from confronting her with his knowledge of the fact in an effort for her to realise who he is. Is it wrong to harass a mother solely because she is single? Yes. But that does not mean one is not allowed to address any of her issues that may have contributed to her singleness. 2. It is unclear whether "beat" is meant literally or metaphorically here. People shouldn't physically beat up anyone for his beliefs; fighting should be confined to defending others from assault. 3. In general picketing funerals is inappropriate, though potentially there could be some reason? I would not put it past an Old Testament prophet speaking against a nation at a political leader's funeral. I am only aware of a single church in the US run by a questionable character and that is hardly representative of Christendom. 4. Possibly not in the capacity as a citizen, but such activity is hardly common by Christians around the world is it? 5. Really? A God who ordered a destroying angel to raise his sword over Israel (1 Chronicles 21) would be averse to using modern weaponry? The confusion here lies in seeing Jesus' mission solely during the incarnation and not also when he returns to judge the living and the dead. Jesus became a man in order to carry out a mission of reconciliation between man and God. Killing all the wicked men living in the first century was not exactly the agenda. 6. Yet all men in Israel were instructed by God to take up arms to conquer the promised land. They were punished for refusing to do so (Numbers 13-14). 7. I presume this is a dig at Amway? 8. Jesus commended a centurion who probably carried a weapon. Jesus' disciples had weapons. Jesus rebuked them when they used them in an inappropriate situation, but no condemnation that they were in their possession. The problem is not owning a weapon for protection, the problem is trying to advance the kingdom thru the power of the sword. As to Jesus owning a weapon: in John's vision of Jesus a sword comes from his mouth (Revelation 1:16); probably not for cutting the wedding cake at the marriage supper of the Lamb. 9. This is probably because Jesus is going to become supreme monarch by force (Revelation 19:15). 10. Allusion to racism? True, Jesus desires men from all nations to join his kingdom (Revelation 7:9). 11. It is true that Jesus loves his enemies, something all Christians should strive to emulate. Note we are to hate our family in comparison to our devotion to Jesus (Luke 14:26). 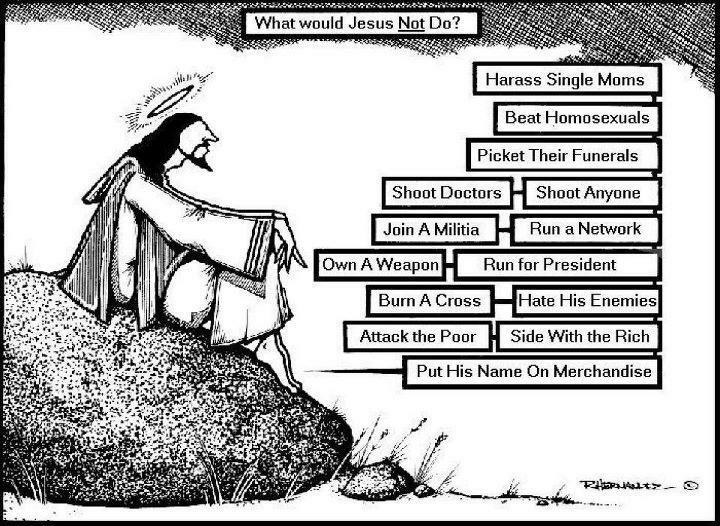 This teaches us that we need to consider how the word "hate" is used. 12. A situation arose with someone asking Jesus to judge on behalf or him and his brother over an inheritance (Luke 12:10). Interestingly Jesus does not side with the poorer (probably younger) brother, rather he cautions him against love of money. Another poor man Jesus heals then subsequently warns to leave sin to escape a worse fate (John 5). 13. Jesus allowed a woman to use very expensive perfume on him (Mark 14:3); he was friends with some rich disciples such as Joseph of Arimathea (Matthew 27:57); and his ministry was supported by some rich women (Luke 8:3). Jesus does not side with people because they are rich or poor. Jesus sides with the poor when they are oppressed. He warns the rich against the love of money. And he shows mercy to repentant sinners. 14. Probably not material merchandise. Though definitely people, those he has purchased with his blood (Revelation 3:12). What people often fail to see is how Jesus interacts with people based on where they are at. Telling the rich man to give his money to the poor addresses his covetousness, incidentally the commandment Jesus did not mention to him initially. He rebuked Pharisees for self-righteousness and unrighteousness. People also sometimes fail to see the reason behind a commandment or action of Jesus. We need a fuller knowledge of our Lord. The judgmental need to learn mercy, the wicked need to learn righteousness, the foolish need to learn wisdom, the antinomians need to learn holiness, and we all need to know that while God takes us where we are, this is not our destination. Who we are is not who we will be. I have read or seen this many years ago. Worth mentioning for those who haven't heard the story. Choir practice at the West Side Baptist Church, Beatrice, Nebraska, US, started at 19:20. Members were always prompt and singing usually commenced by 19:25. On March 1, 1950 a gas explosion demolished the church at 19:27. Yet all the choir members were late to church that one night. Vandegrift and her sister were late because their car had broken down and her alternate ride was late picking them up. The pastor, his wife and his daughter were late because the daughter’s dress was soiled and the wife was ironing another. The pastor had actually lit the furnace earlier in the evening and had returned home. One choir member was working on an important letter while another choir member and her daughter were late because they had to tend to matters at her mother’s house before arriving. Another man was late because he was taking care of his two sons and did not realize until the last minute that he was late. Mitchell, the pianist for the choir, had planned to arrive 30 minutes early, but fell asleep after dinner, causing her and her mother to be late. Joyce Black... waited until the last possible minute before leaving because of the cold weather. Black lived across the street from the church. There is little doubt that God prevented their attendance and is a testimony to his grace. The woman goes fishing, and fishes!